PAST PERFORMANCES For More Information or to Book Your Event, Contact Us! 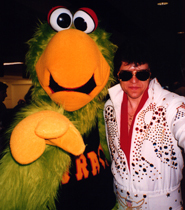 DON WAS VOTED "THE BEST ELVIS IN PITTSBURGH"
BY WQED’s “ON Q MAGAZINE”!! IN SEVENTEEN STATES AND IN CANADA! First Night® Pittsburgh ** - Throughout the years, Don has performed several shows a night, to standing room only crowds, for Pittsburgh's Gala New Year's Eve Celebration - "First Night® Pittsburgh." 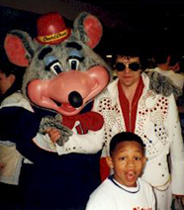 After one of the shows, WPXI later interviewed Don and filmed him singing "Blue Suede Shoes" on the roof of a building in downtown Pittsburgh. 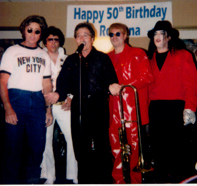 Don with "Johnny Angel and the Halos"
"We have seen many Elvis impersonators, but Don comes the closest to keeping the memory of Elvis alive. 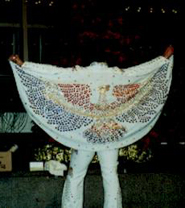 As Don tells people he only performs the 'MAGIC OF ELVIS’. As he starts to sing and your heart starts to pound, you know and believe how true that statement really is." "John Lennon," Don, Jimmy Ross of "The Jaggerz," "Elton John" and "Michael Jackson"
In May 2004, a special premiere showing of “The ‘68 Comeback Special” aired at a few select Regal Theaters around the country. Prior to the start of the movie, Don entertained the crowd at the Butler Regal.